Suddenly it feels like March 2009 all over again. 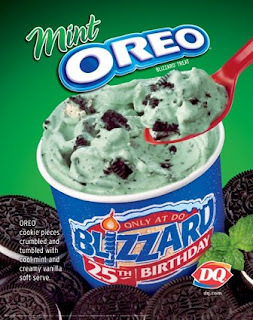 Okay, I'll stop over-analyzing the Blizzard of the Month choice & just give in to the fresh, frosty delight that this treat epitomizes! If you didn't already have a good reason to indulge... take this anniversary to heart. The Blizzard is celebrating 25 years in 2010. Ah, as if I had to twist your arm!! Dig in and enjoy!